Firefox recently dove headfirst into the mobile application world and created the Firefox Marketplace. It is a place where Android users can discover and download new useful apps and content. The best part is that it is all open and non-proprietary, and they have made it very developer friendly. 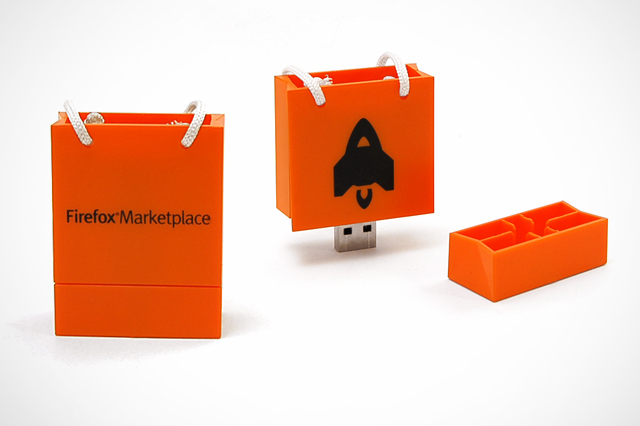 To help promote the new Firefox Marketplace, they came to us for a custom colored and printed Shopping Bag USB drive. You can check out the final product below! If you would like to check out the Firefox Marketplace for yourself just click here, or if you are interested in your very own custom Shopping Bag USB drive, you can request a quote here. A Look at the New Custom USB Drives for Gulfstream	New Custom USB Drives for Utility.